We've run cycling infrastructure study tours in this area for well over a decade. The tours are based in Assen where we live with (for three day tours) a day in Groningen which is just 30 km to the North. People always want to see Groningen because Groningen famously has the higher cycling modal share of any city in the world. It's certainly worth seeing, but Groningen's high modal share is largely due to demographic factors (a huge student population). 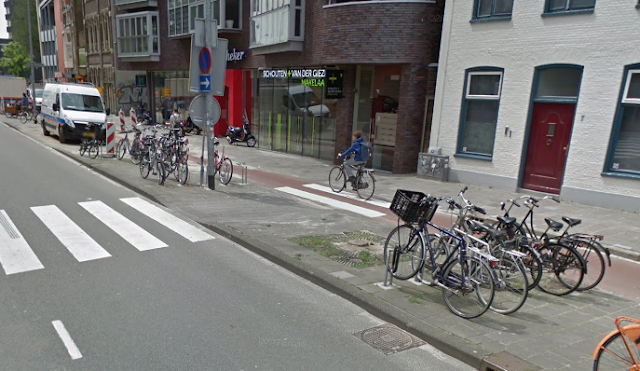 The cycling infrastructure in Groningen simply is not as developed as in Assen and on the study tours we've always used Groningen to illustrate problems that this causes. I've covered a few times in the past how things didn't quite measure up in Groningen, and this is another of those blog posts, focusing this time on two newly built pieces of infrastructure which are not what they could have been. For many years, one of the least pleasant roads to cycle along in Groningen has been Gedempte Zuiderdiep, especially in an Easterly direction. This road has a very strange layout, where the central "road" section is reserved for buses only while the part which looks like a cycle-path is actually for private cars as well. Gedempte Zuiderdiep this afternoon. The car was going very slowly behind a cyclist, but this meant everyone had to go very slowly because "none shall pass". Good drivers on Gedempte Zuiderdiep just get in the way. They catch up with a slow cyclist who they can't easily overtake and stay behind them, but this means the entire "cycle-path" is blocked so that everyone has to travel at the speed of the slowest cyclist. That's no way to make cycling convenient and attractive. Bad drivers toot and rev their engines and make close passes which is no way to make cycling safe and attractive. The layout also places cyclists in the door zone of parked cars. It's simply not a good layout for anyone except bus drivers, who have the only smooth asphalt that any more of transport has: a lane all to themselves which they hardly use at all. Now you might think that this obviously not very good design might be the subject of "a street which has been redesigned", but it's not. Instead, Groningen has instead copied this design elsewhere. The newly rebuilt streets, A-Weg and Westerhaven, have a few changes, which are for the worst. This time the car parking is on the opposite side of the cycle-path which does slightly reduce the likelihood of dooring but only at the expense of drivers having to look all the way through their cars (or vans which can't be seen through) to decide when to pull out, rather than only over their shoulder. The surface is again tiled, but even though it's new it's already even more bumpy than the old layout in Gedempte Zuiderdiep. There is no allowance for how actual bicycles go through corners. Ninety degree turns on the spot are required. This street used to have a slightly too narrow, but smooth separate cycle-path. Recent re-work puts cyclists in this lane with cars. The Google Streetview car caught an example of a driver going along slowly but a bit too close for comfort behind a cyclist, much as in my photo above. The gap to the left of the cyclist, especially with that forgiving kerb providing more space on the left, will lead to very tempting opportunities for a less cautious driver to overtake. In this photo you cab see how as you cycle over this bumpy service you have a very good view of the wonderfully smooth asphalt over on the left, which is reserved for buses only. The surface is so bumpy that it doesn't even look flat in this photo. 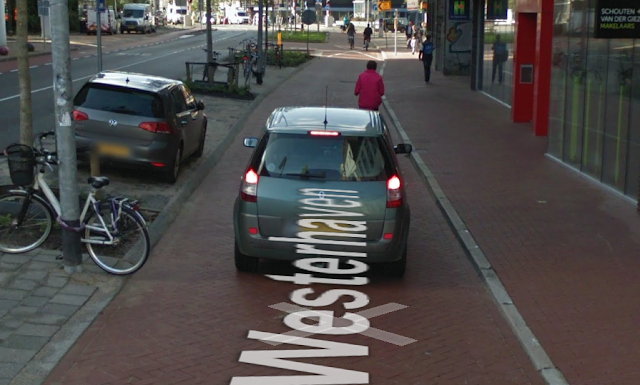 Though this is nearly new, it is already much worse to cycle over than the older example in Gedempte Zuiderdiep, and much worse than the old asphalt cycle-path which used to be here. Note that drivers are provided with forgiving kerbs to get into parking spaces but cyclists are not provided with the same luxury so that they can park easily outside shops. Look at the details: Completed around September last year and it's already falling apart. To turn into Westerhaven from A-Weg you have to make a left turn next to this incredibly sharp and tall rectangular kerb. This reduces the effective width of the turning to about half. You then get to cross a couple of lanes of bus only asphalt before again riding on a bumpy cobbled surface. This is how the old Westerhaven looked. The asphalt cycle-path was of its time and a bit narrow, but it never had cars in it. It was in need of resurfacing and the better course of action would have been to widen at the same time to improve this already good design. Oh, and look at that pedestrian crossing. There are none of those in the new design. Why has Groningen done this ? Why substitute cyclist (and pedestrian) unfriendly designs for old but serviceable designs which merely needed a slight upgrade. Does this city actually want people to cycle ? We have many examples of very good cycle-paths in this area, but none of them were used as inspiration for the new fietssnelweg. Instead of a smooth surface, this new route (the first 3 km of a 30 km route) has 1500 permanently built in bumps along its length, and while at the moment they're not a total disaster, these bumps will only get worse with time. 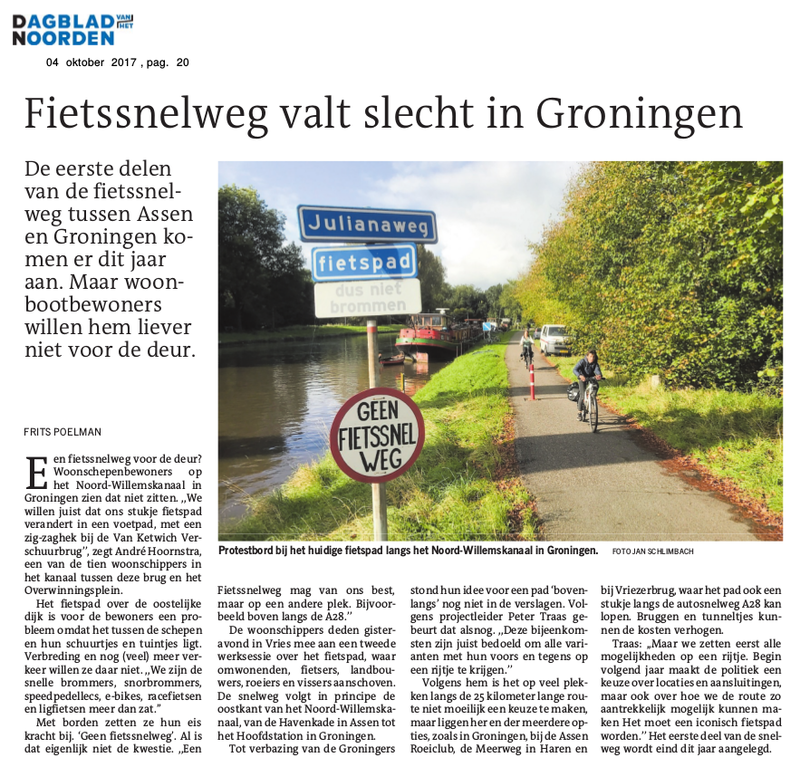 When there are many hundreds of very well designed cycle-paths in this area which have continuous and smooth concrete surfaces, why did Groningen instead choose a substandard method to construct the new flagship fietssnelweg cycle-route ? This could have been so much better if a continuous concrete cycle-path had been created instead of using these separate sections with bumps in-between. Also that traffic light and then the speed bumps ? The routing seems sub-optimal. 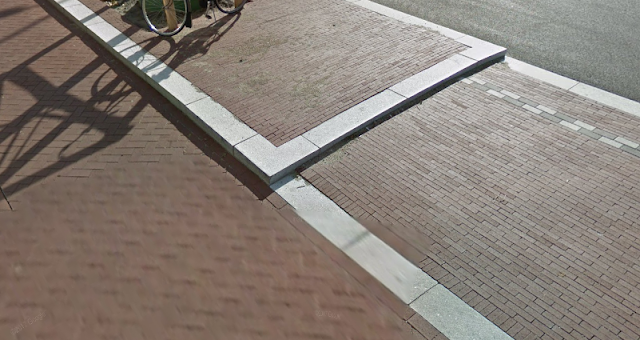 As well as the substandard surface, the new fietssnelweg also does not have optimal routing. The route which has been chosen requires cyclists to ride between house boats and the gardens which belong to those house boats. I don't think it will surprise anyone to learn that the residents are not especially happy. Would you let your child walk out of your door to play in the garden if they had to cross a motorway to get to that garden ? I cycled along this path a couple of weeks ago. Today the path was blocked while cycle-path speed bumps were being constructed. I don't think this will address residents' issues. In my opinion the fietssnelweg would be better on this side of the canal rather than over there. Did anyone think this through ? For many years I've used the existing good quality route on the other side of the canal to ride to Groningen. The straightness of the new concrete section shown in the video does save time over the relatively twisty route on the other side of the canal, but couldn't a straight path have been built on that side instead, or cyclists redirected to the other side before they reached the point where there would be conflict with the house boat residents ? This first part of this fietssnelweg leading into Groningen and then within the city seems to have a lot of built-in problems for a flagship project.